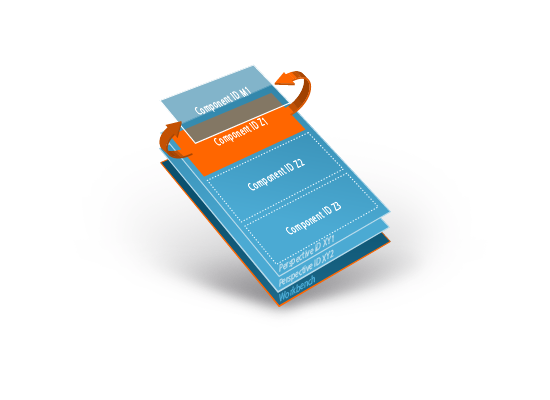 A JacpFX application has a hierarchical structure composed of a Workbench, Perspective(s) and Component(s). All references to them are handled by ID's inside the component annotation of the parent component. Perspectives and Components are resolved by Component scanning on application startup. To exchange a Component reference in a Perspective, simply remove the "old" Component ID and add the new one. Perspectives are defining the layout structure of your view. You can define "render-targets" in your Perspective by ID, to mark areas where Component views should be rendered. Each Component of a Perspective can register to a specific "render-target", so the resulting view of a Component will be included at that specific area. The "render-target" of a Component can also be changed at runtime, so a Component view can be moved from one area in Perspective to an other.